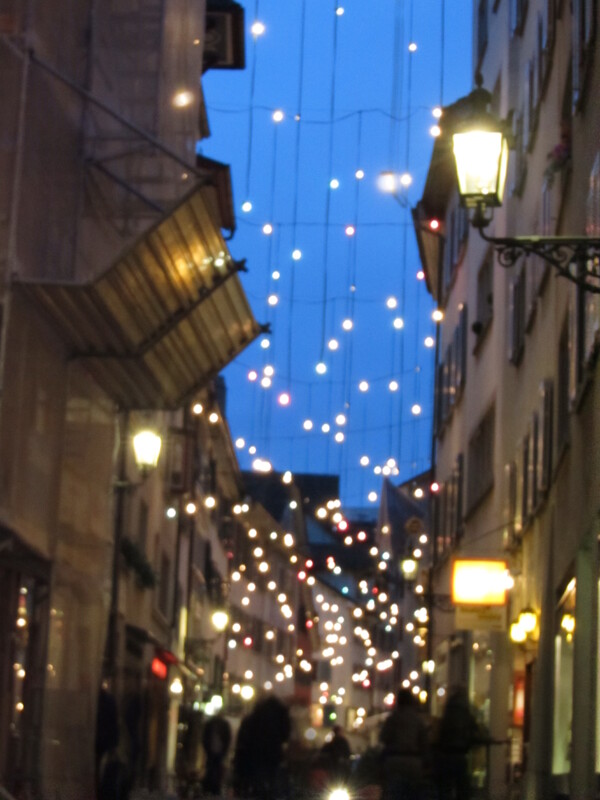 Light's appear to float above a Zürich old-town lane. The lights are hung pendant-style on lines that dangle from cables strung between buildings on either side of the street. They look like giant fireflies when they move in the breeze. 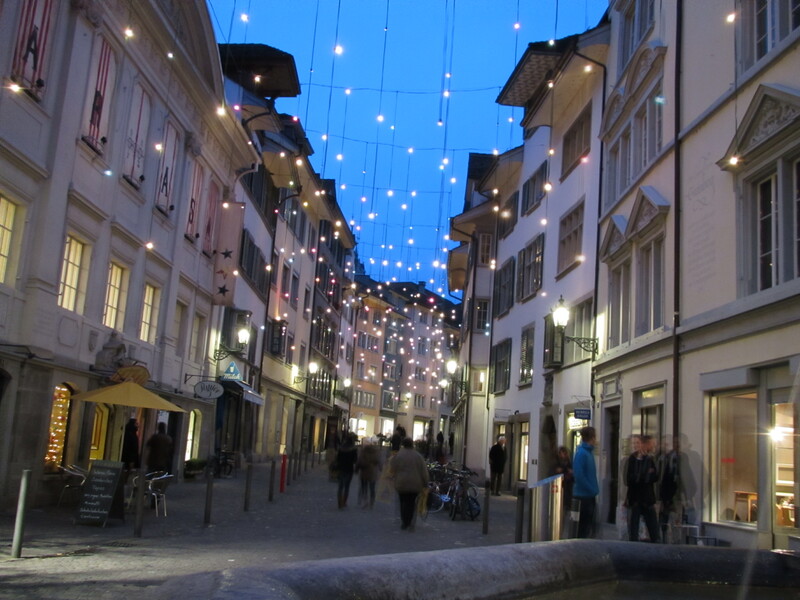 Unbeknownst to the rest of the world, Zürich’s Christmas lights have been clutched in controversy. 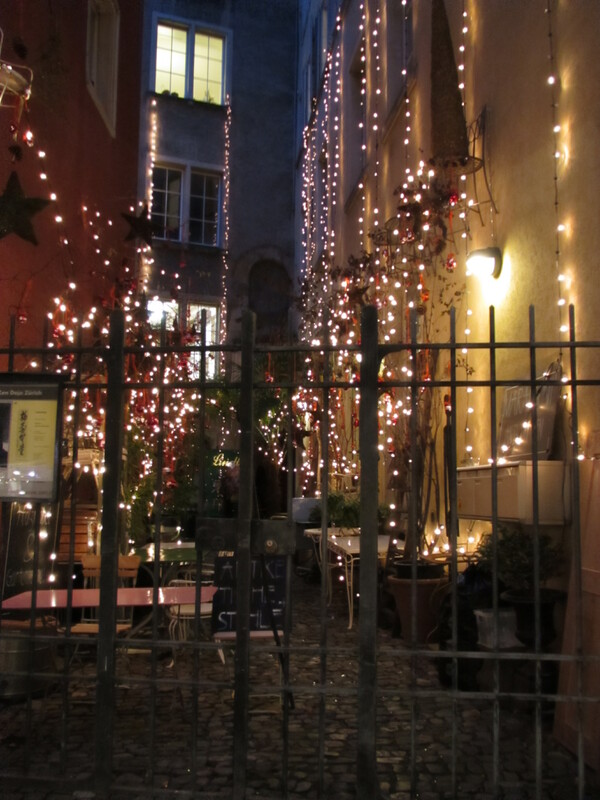 It began when the Swiss, forward-thinking people that they are, decided their light display gobbled down too many watts, and so they put themselves on an electric diet, replacing the incandescent light bulbs with LED. That led to a dismal showing the following year when the Christmas lights did not so much shine as that they glowed like dying embers. The city was cast into shame. This year, the city promised a return to glory with even better LED lights. For reasons not known by me, LED lights also do not photograph well. A posh outdoor cafe in Zurich. There is some discussion among film professionals about images photographed in LED light as being flat and lacking texture. I don’t know about that, but a glance at my photos from our tour of Zürich suggest this is true. At home, I am an LED nut, using these lights to add a lovely glow to my Christmas lighting decor, but the truth is, there are a lot more light strings running through my yard than there used to be, making me wonder if LED is the aspartame of the electric world. It’s meant to help us reduce kilowatts/calories, but in the end, we just consume more, but without the guilty conscience. LED aficionados also praise LED lights for their longevity, claiming they last eight to 10 times longer than incandescents. I’m sorry to report that this has not been my experience. I have already had to replace LED light strings that were only five years old. This does not beat out my old incandescent twinkle-lights’ lifespan. Nevertheless, Zürich’s display did look lovely, although a little dim. It will appear dimmer still in these photos, and that’s too bad.